It should now be showing up in the forums and in your profile. Note that after doing the linking it might take a couple minutes to get into the server's cache and show up. Message 3015 - Posted: 11 Aug 2014, 20:12:54 UTC - in response to Message 3014. Excellent. Thanks for all the hard work. I did notice that after you did this any new credit on DNA@Home (the only project here i particpate in) is not showing in CSG. Message 3017 - Posted: 11 Aug 2014, 21:15:39 UTC - in response to Message 3016. Yeah, I have a script that will fix that. I'll run it one last time after all the credit for the current batch of WUs on DNA@Home has finished. After that it will be automatically updated when work units are finished here. I am now seeing credit on my account for all three sub-projects. However, team credit appears to just be from Wildlife. Message 3020 - Posted: 12 Aug 2014, 5:45:02 UTC - in response to Message 3019. Yeah I haven't updated anything regarding team/host credit yet. It's incoming. Sorry I can't find where to start a new thread on here. So has anyone got there computers showing on there preferences page, mine are not so do I have to remove & reattach to the project or is it something not right with the server? PPL its not yet ready. If you'd read the posts ABOVE yours you would have known. Theres not a single day when he does not write anything. Or repairs, does create new work, and he kept view on THREE projects. Other admins need a complete staff for one project, so i really really have to say THANK YOU Travis. 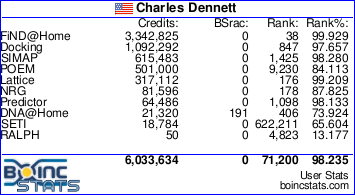 And now for the errors: who threw the screwdriver into the boinc feeder? Message 3026 - Posted: 12 Aug 2014, 21:16:51 UTC - in response to Message 3021. Only myself (and other project scientists) can make new threads in the news forum, because news threads automatically go to the front page of the project. You should be able to start a new thread in any of the other forums however. Message 3027 - Posted: 12 Aug 2014, 21:17:57 UTC - in response to Message 3022. Hmm, not sure if I even started up the CSG feeder yet. It should go live tonight once I've gotten the work generator for DNA@Home updated. Message 3030 - Posted: 12 Aug 2014, 22:53:38 UTC - in response to Message 3014.
but when I go to the link page a second time, it tells me "Accounts successfuly linked". Message 3032 - Posted: 12 Aug 2014, 23:04:38 UTC - in response to Message 3030. I think I found the problem, could you try again and let me know if it works this time? Message 3034 - Posted: 12 Aug 2014, 23:12:24 UTC - in response to Message 3032. DNA worked - but when I clicked the "link" button, the SubsetSum button also went to the "linked/disabled" state (and the input fields to "readonly") so I idn't have a chance to click there anymore. Message 3035 - Posted: 12 Aug 2014, 23:15:55 UTC - in response to Message 3034. Found the problem, I didn't reset your subset sum linked flag in the database. You should be all set now, I got your credit updated. Message 3036 - Posted: 12 Aug 2014, 23:18:11 UTC - in response to Message 3035. Message 3043 - Posted: 13 Aug 2014, 6:02:25 UTC - in response to Message 3042. Hmm, might not be able to fix that easily just yet. But that will eventually respond with the combined values for all three projects. In my account, all calculated points are shown from the individual projects and summed under "Citizen Science Grid combined credit". 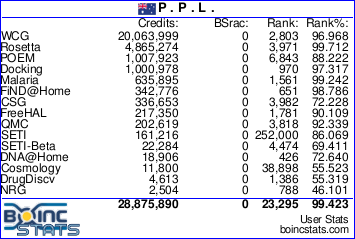 In BOINC Manager only the points that have been calculated with Citizen Science Grid. It lacks the points that were previously calculated by DNA @ Home. Message 3103 - Posted: 14 Aug 2014, 13:23:58 UTC - in response to Message 3102. Thanks for pointing that out, it should be fixed for you, other people who had a similar issue, and for everyone who links their account here on out.